BetOnline.ag offers a diverse selection of promotions for its casino, sportsbook and racebook products. 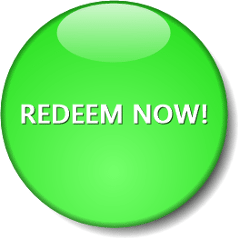 Below we are going to present a number of the BetOnline promotional codes that unlock different promotions. There are also special welcome bonuses that you can receive via email, which we will describe further below. Find the best welcome bonus for you! Click here to open an account at BetOnline. The most popular BetOnline promo codes are either BOL100 for the Sportsbook bonus of 50% of your first deposit for up to a $1,000 or CASINO1 for the Casino bonus of 100% of your first deposit bonus for up to $1,000 free. You must choose between one or the other depending on where you want to play! Enter the promo code of your choice when making your deposit. If you choose the sports bonus, you cannot receive the casino bonus and vice-versa. Click here to open your BetOnline account! BetOnline.ag now accepts Bitcoin as a deposit and withdrawal method. If you already have a Bitcoin account, this is an ideal way to fund your account! There are no transaction fees when depositing via Bitcoin and only takes minutes. And depositing via Bitcoin still qualifies your account for all welcome bonuses. Withdrawing funds from Bitcoin is also an option. There is a 2% charge on the withdrawal amount and the transaction can take up to 48 hours. If you do not have a Bitcoin account, we recommend opening an account at Coinbase JUST TO BUY BITCOINS. Coinbase is simple and easy to use. It’s an online wallet, like Paypal, where you can buy and sell Bitcoin and transfer funds to other parties as well as transfer funds directly to your connected bank account. You are not allowed to use Coinbase for any gambling. Once you buy Bitcoin at Coinbase, move those Bitcoins to Blockchain.info or BreadWallet on your smartphone. 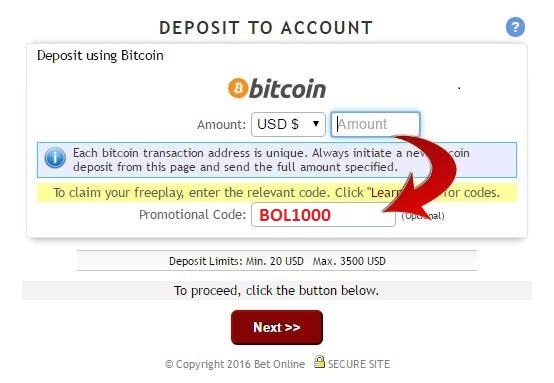 Then deposit Bitcoin into your new BetOnline account from there. The Kickoff Welcome Bonus is a deposit bonus available to BetOnline.ag customers making a sportsbook deposit for the first time. Qualifying deposits must be at least $50, and you must use the promotional code BOL1000 during the deposit process. Deposits made using Book-to-Book, Neteller or Skrill aren’t eligible for this promotion. The bonus amount is 50% of the deposit amount up to $1,000, and the rollover requirement is ONLY fifteen times (15x) the deposit plus the bonus. You can only use the bonus money in the sportsbook, and only sportsbook bets count toward the rollover requirement. Click here to get your BetOnline Sportsbook bonus! The 25% Lifetime Bonus is similar to the 25% Welcome Bonus except that it’s a reload bonus geared toward established BetOnline members. You claim this bonus multiple times, and claiming it blocks you from making any withdrawals in the next 30 days. Qualifying deposits must be $50 or greater, and deposits made using Book-to-Book, Neteller or Skrill aren’t eligible. To claim the bonus, use the promotional code LIFEBONUS. The bonus is worth 25 percent of the deposit up to $1,000, and the rollover requirement is six times (6x) the deposit plus the bonus. You can only use the bonus money in the sportsbook, and only sportsbook bets count toward the rollover requirement. Please note that BetOnline doesn’t allow bonus stacking, so unless explicitly stated otherwise, no promotion may be claimed unless you have a $0.00 balance and all previous rollover requirements have been met. The Mobile Betting $50 Free Play promotion is available to both new and established customers. To claim the bet, simply access the BetOnline mobile casino via your smartphone or tablet and place a single bet of at least $50. If that bet loses, you’re eligible for reimbursement, but reimbursement isn’t automatic. Send an email to freeplay@betonline.ag. Put “$50 Mobile Free Play” in the subject line, and include your account number and the ticket number in the message. You’ll receive the $50 free bet within 48 hours. You must use the free bet in the mobile casino, and the wagering requirement on the bonus is six times the bonus amount or $300. All BetOnline customers are eligible for the Live Betting $25 Free Play promotion. To take advantage of the opportunity, simply place $25 on an in-play bet. If that bet loses, the sportsbook will award you a $25 free bet within 48 hours. You must use the $25 free bet on live betting, and the wagering requirement on the free bet is times or $150. Read an in depth review of the BetOnline live casino experience here. BetOnline.ag will match any deposit of $100 or more by 100% up to $1,000. The bonus money and the deposit are usable for any casino game, but only wagers made on slot machines, not including mobile slots, count toward the wagering requirement. The WAGERING requirement is 50 times the deposit plus the bonus. Therefore, if you deposited $1,000 to claim the maximum bonus, you’d have to wager $100,000 in order to clear the requirement! To claim this bonus, simply use the promotional code SPINBOL when making your deposit. Click here to visit the BetOnline Casino! As an alternative to the Slots Match Bonus, BetOnline will match any casino despot of at least $25 up to $1,000. In order to claim this bonus, you must use the promotional code CASINO25 during the deposit process. The wagering requirement is 50 times the deposit plus the bonus. You cannot use the bonus money on Baccarat, Blackjack, Craps, Roulette and mobile casino bets, and wagers placed on Baccarat, Craps and Roulette don’t count toward the wagering requirement. To claim this $25 free play, simply place your first wager in the BetOnline live casino. The best must be at least $25, and if the bet loses, the casino will reimburse it with a $25 free play. The rebate is not automatic. You have 24 hours to claim it, and you claim it by sending an email to casino@betonline.ag. Put “$25 Live Dealer Casino Bet” in the subject line, and include your account number and the ticket number in the message. You must use the free play in the live casino, and the wagering requirement on the free bet is six times the free play or $150. Read a detailed review of the BetOnline live dealer experience here! A BetOnline week begins on Monday and ends on Sunday at midnight. If during that period you lost at least $100 overall, then the casino will rebate 10 percent of your losses up to $1,000 per week. Losses from tournaments or the mobile or live casino don’t count. The rebate is not automatic. Send an email to casino@betonline.ag with the subject line “10% Casino Rebate.” Include your account number in the email body. The rollover requirement is 50 times the rebate amount, and excluded games include Baccarat, Blackjack, Craps, Roulette and all games in the live and mobile casino. This offer is open to all BetOnline members who’ve not yet placed a racebook wager. Simply place your first bet, and if that bet loses, the racebook will reimburse it with a free play worth up to $25. This bonus is not automatic, and you must claim it by emailing freeplay@betonline.ag with the subject line “$25 Horse Free Play.” Include the account number in the email body. Racebook bets on the Belmont Stakes, Breeders’ Cup, Kentucky Derby and Preakness Stakes aren’t eligible. Bets on matchups, futures and props aren’t eligible either. The free play must be used on an eligible racebook bet, and the wagering requirement on the free bet is six times the bonus amount or $150. Most wagers placed at the BetOnline racebook are eligible for rebates. Exceptions include matchup bets, fixed-odd bets, propositional bets, tracks in categories D and E and wagers that pay $2.20 or less for $2.00. Bets placed via the website or mobile app are rebated at a 7 percent rate, and bets placed via the telephone system are rebated at a 4 percent rate. There’s no limit to the rebate amount you can earn on a daily basis, and the rebate is actual money rather than bonus money. Join BetOnline and place your bets today! If you like betting on sports, you’ll probably also enjoy playing fantasy sports for real money. We recommend playing at DraftKings! Read this DraftKings review. Thank you, I used the SLOTS100 promo code and it worked for the casino but I also received all those other bonuses as well, so that code was good everything. I play on the sportsbook almost everyday NBA season right now, March Madness is also here, PGA season, UFC this weekend, it's great! Thanks, I highly recommend BetOnline.